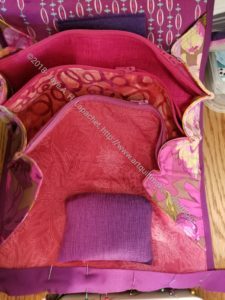 This bag and the gift Sew Together Bags have been on my list for a long time. As usual, the cutting took forever. As I mentioned, last week, after the March Sew Day I decided to get busy and get these done. I remembered, after laboring for what seemed like hours, why it has been awhile since I made any more of these. The layers you have to sew through is daunting. These are very useful bags, but a pain to make. ink the strips for the long zipper would lay better if they were on the bias. I tried out my bias advice. The binding strips still do not lay completely flat once the bag is sewn together. It could be the difficulty of stitching through so many layers. I would also add: make sure you don’t get an invisible zipper. I had to rip out the stitching on the main zipper several times before I got it to a point where I could stand to look at it. I am almost finished with this bag. I am working on two others and am not sure I will ever make this bag again. I’ll probably forget the drama and make more at some point when my rose colored glasses are back on.